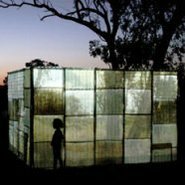 Hear more about this immersive installation and how it explores ideas of home and housing, culture and community. Join assistant curator and curator of Aboriginal and Torres Strait Islander art at the Art Gallery of NSW Emily McDaniel as she discusses the realisation of this work from a curatorial perspective. Sydney-based Wiradjuri/Kamilaroi artist Jonathan Jones joins us to talk about the process of collaboration with the Euraba Artists and Papermakers.